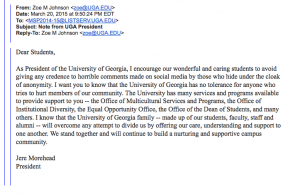 ATHENS, Ga. – UGA P resident Jere Morehead sent out a statement to all of the Multicultural Services and Programs through an email last night around 9:00 p.m. Morehead addressed the recent racial comments made on social media. You can see the email that was sent out by Morehead on the left. As President of the University of Georgia, I encourage our wonderful and caring students to avoid giving any credence to horrible comments made on social media by those who hide under the cloak of anonymity. I want you to know that the University of Georgia has no tolerance for anyone who tries to hurt members of our community. The University has many services and programs available to provide support to you — the Office of Multicultural Services and Programs, the Office of Institutional Diversity, the Equal Opportunity Office, the Office of the Dean of Students, and many others. I know that the University of Georgia family — made up of our students, faculty, staff and alumni — will overcome any attempt to divide us by offering our care, understanding and support to one another. We stand together and will continue to build a nurturing and supportive campus community.